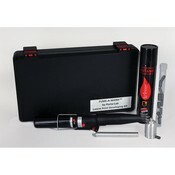 The Fume-A-Wand butane fueled, auto-igniting fuming gun can be used in the lab or at a crime scene for developing prints by means of cyanoacrylate fuming. To use the gun, simply insert a fuming pellet and ignite the safety trigger switch. Cyanoacrylate fuming begins almost immediately. The gun is also provided with a built-in bipod stand which keeps the hot tip of the gun off surfaces during cool down. The cyanoacrylate pellets are available in standard for traditional fuming and Orange-Aid UV for enhanced coloring and UV viewing without additional chemical treatments. Our butane cartridge will fuel three to four hours of continuous operation. Note: Traditional standard size brass fuming cartridges can be used with the Fume-A-Wand by inserting the cartridge into the fuming head in the same manner as you would with the pellets. • 1 ea. Copolymer Carrying Case, w/foam inserts (10.25" L x 7" W x 1.75" H). • 1 ea. Complete Cyanoacrylate Fuming Gun. • 1 ea. 1.48 oz. Butane Cartridge. • 10 ea. Standard Cyanoacrylate Cartridges. • 1 ea. Cartridge Extraction Tool. • 1 ea. Kit Instruction Sheet.